In Sabah, the bobohizan, or high priestess, braves the tides of modernity to bring changes into the lives of those around them. The sceptics say it’s a load of superstitious nonsense; you’d have to be a certified nut to believe it. However, that has never discouraged some of Asia’s richest and most powerful from dabbling in the occult. Ancient rituals have been known to change the world, from the way governments are run, to the personal decisions that are made. Some time back, exiled Thai ex-premier Thaksin Shinawatra’s cousin and former supreme commander of the armed forces, General Chaisit Shinawatra, was rumoured to have visited a medium. 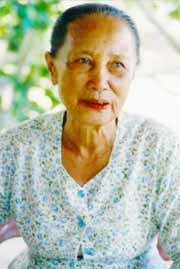 Losimin Majanil is one of the few remaining bobohizan in Sabah. His reason: to put the evil eye on Thaksin’s opponents. According to the Bangkok Post, this rite was just the latest in a series of black magic war being waged by both the pro- and anti-Thaksin camps to topple each other. On the other end of the spectrum, spiritualists and clairvoyants play a more benign role in Mumbai, India. As the polls draw nearer, they remain close at hand should any political candidate need their advice after a long, hard day of campaigning. Malaysian politicians and celebrities aren’t oblivious to the wonders of the occult either. Many are known to visit bomohs with various requests to increase their power, wealth and beauty. Enter 84-year-old Losimin Majanil, Malaysia’s very own “living heritage” — a term given to those recognised by the government as celebrated experts in their field. She isn’t a scientist, nor is she a technical specialist of any kind. In fact, her occupation defies conventional logic. Losimin is a shaman — one of the few surviving ones from Kampung Limbanak in Penampang, Sabah. “My grandmother used to make me walk with her to Losimin’s house,” says Agusta Lojiwin about her aunt. “It was a very long trek, but well worth it. I recall watching her dress up in brightly coloured bird feathers and dancing the most unusual dance. She doesn’t really do it anymore, though. Dr Hanafi Hussin established close ties with Losimin Majanil while he was doing a study on bobohizan. Their encounters are well documented in Ritual dan Identiti. The average toddler would be spooked, but not Agusta, who is in her 40s and currently doubles up as Losimin’s translator. She grew up in a typical Kadazandusun community that has long prided itself as spirit worshippers. As a child, Losimin decided to give regular school a miss, and instead chose to train as a bobohizan. “It wasn’t as easy as I thought — there were countless chants to memorise, benevolent spirits or “guardians” to befriend, and an ancient language to learn,” she said. Each village has several high priestesses, known as the bobohizan. However, Losimin was the best liked of them all. She is Penampang’s very own Aunt Agony: the villagers would come knocking at her door when they were ill, when their spirits needed a little jolt or when they wished to communicate with a loved one who had passed on. To those who have known and loved Losimin for years, it wasn’t surprising that the Culture, Arts and Heritage Ministry held a ceremony to honour her and three others who received the living heritage award in Kuala Lumpur in February this year. It was the government’s way of giving them a pat on the back, to encourage them to continue with their invaluable work so that tomorrow’s generation will be able to look back and see where they came from. “It’s a shame that the bobohizan is no longer needed today,” says director of the Culture, Arts and Heritage Ministry, Siri Neng Buah. What really makes the bobohizan special, however, is that it is strictly a female preserve. According to cultural researcher Rita Lasimbang, these female shamans are ritual specialists, herbalists, therapists, consultants to the village head, teachers of culture and customs and champions of women’s rights and needs. Their secrets have been passed down from mother to daughter, and from aunt to niece, verbally, for generations now. Unfortunately, the buck stops here. There are only a handful of priestesses like Losimin left, and they are from generations past. Thanks to modernisation, there’s no room for anything deemed antiquated, including the identities and institutions that once made the people unique. Siri predicted that the institution of Sabah’s female shaman won’t last the decade, and he might be right. Losimin is a tough, graceful woman with a pretty face weathered by age. These days however, she shuffles slowly around in an arthritic stoop as her body surrenders to the ravages of time. “I have cancer,” Losimin says matter-of-fact. For most people, this raises questions. If Losimin was such a great shaman, why couldn’t she cure herself? “Does a doctor cure himself? Or does he go to another doctor to do it?” retorts Agusta. Losimin’s grit has left numerous friends and family members, including Agusta and Dr Hanafi Hussin, head of the South-East Asian Studies Department at Universiti Malaya, shaking their heads in wonder. Hanafi first met Losimin back in 2000, when he was doing research on his thesis about music and dance. Some of the greatest dances, he said, have their roots firmly grounded in the rituals of the bobohizan. To do so, however, he needed to find a priestess who could help him document their every routine. “I’d heard so much about bobohizan prior to that,” says Hanafi. “In fact, some Tan Sri and Datuk I know have come from this community and are great believers in it to this very day. I also know a certain Datin who’s a practising Bohongkitas, which is even greater and more powerful than a Bobohizan. They are the highest in the hierarchy. Hanafi and Losimin did not start out as the best of friends. “She was really wary of me at first. She saw me as an intruder, and the fact that I was a man made it 10 times worse. She was always complaining that I asked too many questions,” Hanafi said. He persisted despite this setback. He lived and worked among the villagers for weeks on end, hoping for a breakthrough. Then one day it happened. “No one had tried to interview me before this young man so I was uncomfortable,” Losimin said. “But he was very patient and sincere. He was asking me about my family for the thousandth time when I started to feel sorry for him. So I asked him to share a sirih (betel leaf) with me,” Losimin said. This led to a series of extraordinary tales and observations spanning four years with Hanafi travelling back and forth from Kuala Lumpur to Sabah. He usually visited Losimin in the evenings, just as she was getting ready to wind down for the day. Their primary role is in appeasing the rice spirits during the harvest festival. Each May, a bobohizan will lead a procession of people from her village through the padi fields under the full moon, to give thanks and seek a bountiful harvest for the farmers. That’s not all. A bobohizan is also responsible for the well-being of visitors. Those living at the foothills of Mt Kinabalu will conduct an annual ritual of animal sacrifice to seek permission from the mountain’s spirits to provide a safe journey for climbers to the peak. One of their most common duties, however, involves healing the sick. “People come to me to be cured for various reasons, and not just physically,” says Losimin. Sadly, most of the rituals these days have been reduced to mere sideshows for the tourists. 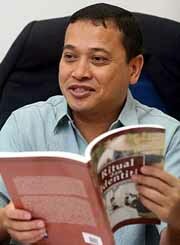 “Sabahans are a superstitious lot,” says Hanafi. “Dying traditions like kenduri nenek moyang is still being practised there, but these are few and far between. “Actually,” confides Agusta, “I’ve tried to learn a few rituals myself but I failed terribly! Not only do you have to use different alphabets and words, you’d also have to commit everything to memory. So I tried to record it down instead, but that didn’t work out too well, either. Dia punya bahasa berlilit-lilit (the language is so complex)!